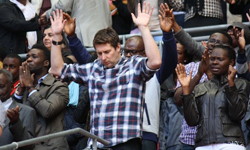 Wembley Stadium was overtaken by a wave of prayer and praise when more than 32,000 gathered for the National Day of Prayer and Worship on Saturday (29 September). Tens of thousands more were able to join the day through live broadcasts and streams via GOD TV, Revelation TV, OHTV, Premier Radio and UCB. During one of the key moments of the day as 300 young Christians in red hoodies were being commissioned to carry on the baton of prayer into the next generation, a Mexican wave of united prayer engulfed the whole stadium as tens of thousands were believing for a new wave of revival to hit the UK. The day carried the theme of the Lord’s Prayer and began with a time of thanksgiving for the fulfilment of a 17-year-old Wembley vision, the Diamond Jubilee, the Olympics, More Than Gold and for Government. Then many key leaders from different denominations and organisations took to the stage to lead prayers for the nation and unity. Later Samaritan’s Purse UK Executive Director Simon Barrington prayed for the world’s neediest children, after a touching performance by a children’s choir, while Tearfund’s Matthew Frost then led a time of prayer for the one billion people going hungry all over the globe. There was a wave of praise and worship throughout the day from a wide variety of artists including Remanente, Sound of Wales, Tim Hughes, Noel Robinson, Matt Redman, Guvna B, Hillsong, LZ7, Graham Kendrick, Lara Martin, and the NDOP Mass Choir. Also prayers were said for the global church and more locally for some very new and exciting community prayer and outreach initiatives in the UK including Neighbourhood Prayer Network, Hope 2014 and Crossing London – Mission 2013. That carnival atmosphere combined with the fantastic weather even greeted the thousands pouring into the stadium along Wembley Way with bright and colourful exhibitions and market stalls. Also before the day began, in an unprecedented display of unity 1050 leaders gathered in the Bobby Moore Suite for a lunch reception. Jonathan Oloyede, the NDOP Convener gave a mandate for everyone to take the baton of prayer back to their streets, towns, cities and stadiums. He urged all Christians across the British Isles to join the dots in prayer and mission. NDOP organisers are hoping that Wembley 2012 will be a catalyst to help regional gatherings of prayer emerge in the months to come as well as support other stadium events.